Anyone else in for this? I'm already booked in. I've been to Rome and you can't walk 100 metres without passing something historical. However, it is very cobbly in places and the race route does run over them. Vienna is a stunning city as well - one of the most beautiful in Europe. I visited last year and am looking forward to running around it. I'm signed up for this. Never been to the city before, so looking forward to running this one. Ran this in 2016, great event, fantastic city. Decent flat course, and great start running across the river. Worth a few days stay if you can . Ran my pb here.... enjoy! Thanks Mike. I will be spending a few days in Vienna. I decided to run after spending a mini-break there last year. I'm a rollercoaster enthusiast and wanted to visit Prater Park but it snowed and all the rides were closed. I thought, well, why not do the marathon, then I can come back and do the rides! I seem to have the stamina, but not the pace I'd like just now. Felt strong on all my long runs, but my pace on the faster sessions is a bit slower than I've hit in previous years. I'm running the Big Half in London next weekend and plan to try and race that, so that should give me an idea where my form is. Looking forward to visiting Vienna though. I think there's a slice of sachertorte with my name on it for after the marathon. Long runs have been fine but I have a lot of niggles. I had two HM PBs in Feb, back to back, but couldn't go quite as fast at The Big Half due to the bloody awful wind. I saw a biomechanics specialist yesterday who has given me some exercises to help fix my faulty movement patterns and hopefully I'll have improved a bit by the time Vienna rolls around. It's getting close! Cal - Half PB's back to back! Sounds like you're in good form. I ran the Big Half the other week and managed to get a PB. The wind didn't bother me too much as it was mostly behind us. It must be the flatest half I've ever ran. Not long to go now, which obviously means I'm surrounded by an office full of people coughing and sneezing! Yeah there's really only the slopes in and out of the tunnel. Hampton Court is very flat, though, and I hit that in perfect conditions. I think, by the time the Big Half rolled around, I was probably quite tired. Glad it's taper time. I do a lot of hand washing and if anyone so much as sniffs near me, I take some echinacea. I do not want a repeat of Valencia (supposed to be my first marathon abroad, but I came down with the worst cold just before it. I wasn't well enough to fly, let alone run). That's a nightmare to come down with something like that at the race weekend. I've heard good reports about Valencia. Taper time now. I've been feeling tired this week. I think the taper arrived just in time for me. Yes, I had a rubbish run yesterday, but then surprised myself with a parkrun PB today so, fingers crossed. Well done on the parkrun PB! I don't think this has quite hit me yet that this is less than two weeks away now. I know! A bit scary as I'm pretty much held together by gaffer tape. Yesterday's run was ploddy again and my back ached like hell. What day are you flying? I'm going on the Thursday as I'm also having a mini-break with a friend of mine. Will go to the expo on the Friday. I fly out stupidly early on Thursday morning and back again on Tuesday. My trip was entirely based on the Sleazyjet flight schedule. I'll be aiming to visit the expo on Friday as well. Get that out the way and have a relaxing day on the Saturday. At present I'm not carrying any injuries. Fingers crossed I stay injury and illness free for the next two weeks. I'd like to try and put in a good run at this one. No, I'm based up in Glasgow. I have getting up early enough to catch the 6:40am flight from Edinburgh to look forward to! Oh fun. Out of interest, are you going to do any running in Vienna before the race? I've not decided whether I should try to fit in a little leg stretcher or not. I'll do a very gentle 5km either on the Friday or Saturday morning. 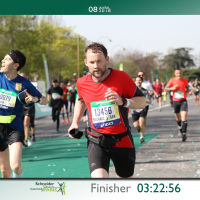 I've been in the habit of doing that the morning before the race for a few years, after taking part in the Breakfast Run the day before Paris Marathon. I did that the first time I ran Paris in 2012 and I hit my target that day. I've done that ever since and it's mostly worked. I pretty sure it's entirely superstitious though and the previous 18 weeks of training has the bigger impact! Good luck everyone for Sunday. I’m in Vienna now. Hopefully we all have a good run on Sunday. I hope hope everyone had a good day yesterday. I absolutely smashed my PB, finished in 3:33:00. I will be the smuggest tourist in the city today! Well done Eggy! I had a less than ideal run. I think I did too much walking the days before and the warm weather got to me. Well on target for a PB until mile 17 but then the wheels fell off and I finished in 4:14:17. The worst bit was (and is) my feet - they were killing for the last 10 miles. I tried every trick I knew to distract myself from my discomfort but nothing was working, alas. Ah well, the medal's good! Also, what genius decided that bananas were a good thing to hand out at water stations? Having to dodge banana skins as well as plastic cups made those bits rather, um, interesting! Sorry to hear your run didn’t go to plan. The banana peel didn’t really bother me, but the plastic cups everywhere at those water stations were a bit of a nightmare. It was certainly hotter than expected, but thankfully I dealt with that on the day. Do you know what caused the pain with your feet? Probably too much walking around in the days before. I have suffered with my feet before - I have very thin fat pads, and the combo of walking and warm weather made it worse. At least you’ve enjoyed the city. I’ve ran enough marathons now to know what I need to do the day before the race. I tend to be active in the morning, but stay off my feet as much as possible the rest of the day. Yes, that's what I usually do. But I was traveling with my non-running friend and he needed some cheering up after losing his wallet on the first day so we bumbled around Prater for most of the day. You can rack up an awful lot of steps just walking around amusement parks. Ah well, back to Manchester next year! Lost wallet! You really did have an eventful trip.